It is universally uncontroversial that children are highly vulnerable to being be inculcated with the religion of their parents, and, possessing little critical thinking skills, they rarely turn away from their faith until possibly later in life. However, most, it is assumed, stay with their childhood indoctrination for the remainder of their lives. Here is where Christianity fails an important test of logic and fairness. 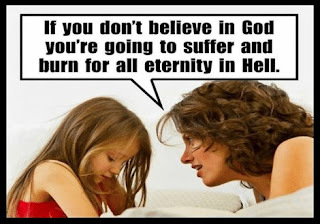 If the criterion for entry into heaven is as suggested by the Apostle Paul and the Gospel of John, that acceptance of Jesus and his sacrifice on the cross is both necessary and sufficient to spend eternity in heaven, then those children born into hon-Christian homes are at a decidedly unfair disadvantage. Unlike the pre-programmed children, they have to somehow extract themselves from their family faith, often suffering severe domestic repercussions, and discover the ‘truth’ of Christianity. This is like running a race while giving some a big head start. It is inconceivable that a supreme deity could set up a system as unethical as this. But along the way, this concept was seen by church leaders as being too universal and didn’t serve their purposes for gaining power and riches. So the concept was developed that that the path to heaven was through Jesus exclusively. This was reflected in later scriptures and adopted as standard Christian dogma. And with that maneuver, eternal exaltation became an arbitrary crap-shoot of where you were born.